The vast majority of homes, even high end custom homes, don’t include a space where the outdoors can be enjoyed from a temperature controlled area. Why builders shy away from providing this type of space is a good question, considering the value and enjoyment that sunrooms provide. 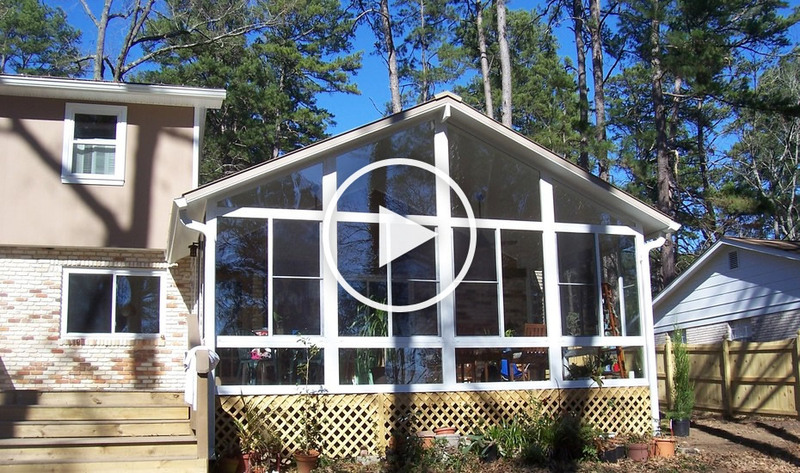 But All Custom Aluminum can create your dream sunroom on your existing deck or concrete pad. And if you don’t have a foundation in place, we can provide one as part of the project. Sunrooms provide a type of space which is intermediary to the house and the outdoors while allowing year round enjoyment. And though many people assume that such projects are out of their budget, All Custom Aluminum provides many options along the spectrum of price which afford the option of an enclosed sunroom to any homeowner. The first thing to do when considering a project of this kind is to evaluate your needs. While most people assume that an insulated glass enclosed space is what they need, there are other options worthy of consideration that may be a better fit and provide all the same benefits. All Custom Aluminum constructs and installs glass sunrooms as well a full line of patio oriented vinyl pane window systems which function in much the same way but at a lower cost and increased versatility. It is worth considering the relative advantages of each type in determining which one is best suited to your needs. Insulated glass sunrooms create what Municipalities term “habitable” space by virtue of the material being used. Because a glass surround creates this “habitable” space, it is considered to be an extension of the footprint of the home. As such, there are many code compliance issues that come up that must be addressed in order to construct a glass sunroom. The first is the foundation. Because of the weight of glass, a glass sunroom foundation typically has to be about as robust as a footing for building a wood framed structure, which is to say pretty robust. These footings must contain steel reinforcement called rebar, and be of a certain dimension to be code compliant. If you are constructing from scratch this is easily accomplished. But for those with an existing deck or patio thickness slab (most exterior slabs are patio thickness) the lack of a structural footing creates a problem. In many cases, homeowners wish to simply “fill in” an area which is part of the home but has an open wall or walls. Because these areas are constructed as part of the footprint of the home itself, they usually have the same footings as the rest of the home which makes installing glass windows without additional footings possible. Also, since adding a glass surround to a space creates more interior square footage, many of the codes which apply to the interior of the home apply to these spaces. This includes electrical service. Just as code requires that interior walls have electrical outlets, most added glass room walls are required to have electrical outlets. And egress doors are required to have a light illuminating the door. Although not dramatic in cost, electrical work does add to the overall cost of the project. Many Municipalities also require insulation be added in the attic above an area which will be surrounded by glass walls. Keep in mind that glass windows, although they typically open and close, don’t allow for full ventilation. When a glass window is open, only about 45% of the overall area of the window is allowing air to move through. So most full glass installations require heating and cooling to remain in the comfortable temperature range year round. Many times, adding a damper and expanding existing HVAC to provide service to the new area is possible. But if not, there are many options for providing stand-alone service to an area at a reasonable cost. While the fact that constructing a glass enclosed patio, porch, or deck creates square footage which is added to the home footprint can be a liability, because it will increase the property tax assessment, it also creates instant equity which can be many times the investment. All Custom Aluminum specializes in these type installations, which means we have more options than most contractors who don’t work primarily in the aluminum and glass industry. Thus we can also save money over doing things the old fashioned way. And that’s not the only benefit to using All Custom Aluminum. 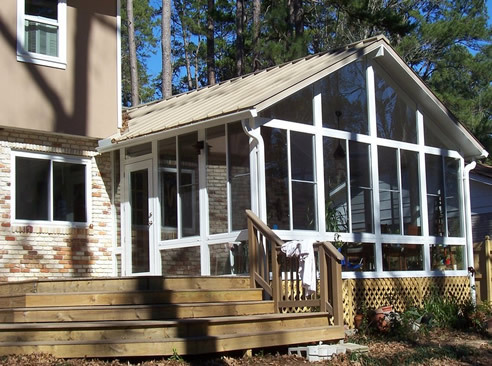 Whereas wood framed sunrooms utilize bulky, maintenance intensive wood framing, we use all finished aluminum framing. Since our aluminum framework is less bulky than wood framed components, we provide a sunroom in which the glass is the star of the show. Besides providing a framework which is a factory match to most window frames, affording an integrated aesthetic appeal, All Custom Aluminum utilizes very large size windows to further create that dramatic “outdoors-in” appeal. Traditional wood framed structures typically contain multiple smaller windows which adds more framework and cuts down on the openness and light in these rooms. All Custom Aluminum provides a wide variety of options when it comes to glass windows. We sell single and double hung options, as well as vertical and horizontal windows, fixed glass, glass entry doors and sliding doors and more. We work directly with the manufacturer, who specializes in the outdoor living industry, creating windows to order, rather than using standard or commodity sized windows. This means we can construct a sunroom which is literally tailored specifically to fit your needs. If the circumstances don’t make installing glass windows your best option, perhaps you should consider going with a vinyl pane patio window system. Built utilizing an extruded powder coated frame similar to that of a glass window, but featuring a high strength, durable clear vinyl instead of glass, these window systems are one of the industry’s best kept secrets. Available in a number of configurations, from vertical to horizontal to multitrack, these window systems insulate as well as a single pane glass window, yet can be removed completely in minutes to allow for 100% ventilation. Vinyl pane patio window systems are engineered to integrate seamlessly into existing patios and screen rooms, yet can also be designed to be installed in newly constructed rooms. There are two main styles that are most popular, the vertical four track and the horizontal slider. Vertical four track patio windows include an exterior frame with four sashes, each about a quarter of the overall height of the window. Each of these sashes can be raised or lowered, and the sashes collapse into one another. One advantage to this style is that, in the open position, 70% of the window allows ventilation. This is much better than a standard single hung or horizontal slider. However, there are some things to consider with regard to the vertical four track. First, the opening should be taller than it is wide, as the wider openings make operating this window more difficult. Also, the openings shouldn’t be so high that they can’t be reached easily, as this makes seating the sashes challenging. And the vertical four track window is subject to more strict size limits than other options like the horizontal slider. But, for the right situation, these windows are the perfect solution to many homeowners’ problems. 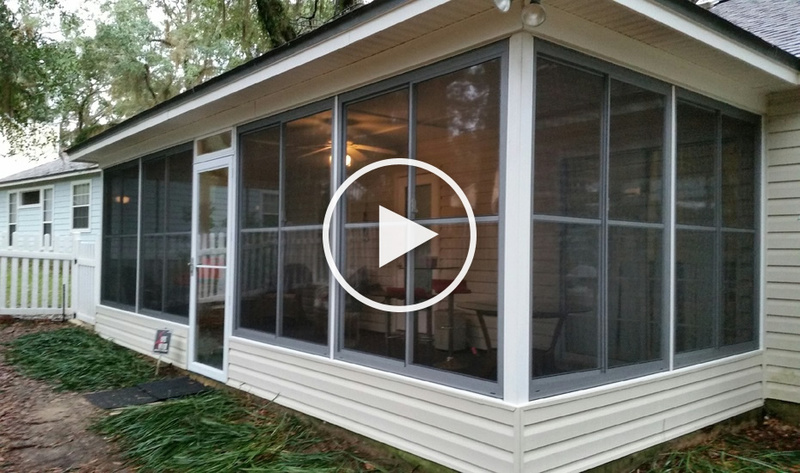 The most versatile and easy to operate option is the horizontal sliding vinyl patio window. Available in any size up to 9’ by 9’, this window system is a great value. Because it consists of two sashes which both move horizontally on rollers, it is easy to open and close. And it incorporates a series of locks for security that also serve to lock the sashes in place. One thing worth noting about the horizontal slider is that, because it looks very much like a traditional sliding glass window, many people would assume it is a glass window for even just a few feet away. In general, vinyl patio window systems have several benefits over glass windows. First, they don’t require any special footings because of their light weight, making them buildable on virtually any deck or slab. Also, because they are removable, these window systems are not considered permanent by Municipalities and the space they enclose is not assessed as additional square footage. This means vinyl pane patio window systems can afford the utility of a four season sunroom, with much less regulation, hassle, and expense. Like our custom glass windows, vinyl pane patio windows are measured precisely on site and made to order at the factory specifically for you. We at All Custom Aluminum handle everything, making the process simple and easy. When the windows arrive, we install them professionally, and you are left with a beautiful enclosed space that will look like you spent a million bucks, but your wallet will know better.